She kept losing her eyesight, and no one knew why. Then a doctor asked about her mental health. Diana Chao, 20, is a sophmore at Princeton University and a youth mental health advocate. When she was 14 years old, Diana Chao began having migraines. She often felt dizzy as she walked. Sunlight seemed to pierce her skull. “It felt like shards digging into my eyes,” said Chao, now 20 and a sophomore at Princeton University. Discussing women’s health can be taboo in their cultures. These young women are changing that. After a week of constant pain, her parents took her to an optometrist. That’s when they learned she was “swelling from the inside out,” Chao recalled. She had uveitis, an inflammatory eye disease that can send the pressure inside an eye soaring and render people temporarily blind. For the next four years, Chao visited ophthalmologists, rheumatologists, and many other specialists in Los Angeles to find a cause. Episodes of temporary blindness resurfaced every few months, as she underwent a battery of tests. “But every single test came back fine,” Chao said. Until one ophthalmologist said she’d seen the condition in several patients with mental illness. That’s when it clicked for Chao, who had been diagnosed with bipolar disorder as a teenager. Her body might be reacting to her mind. Research shows that mental illness can often manifest as physical symptoms. Depression can show up as headaches, anxiety as gastrointestinal issues, or post traumatic stress disorder as back pain. The phenomenon is especially common among Asian Americans, multiple studies show. More research is needed to understand why, but psychologists suggest it may relate to the stigma around mental illness in many Asian cultures that prevents people from discussing it openly, as well as traditional Eastern views of an interconnected mind and body. But many clinicians are unaware of these somatic, or physical, symptoms of mental illness among Asian Americans, leaving a population of more than 21 million underdiagnosed and undertreated. Chao, a mental-health activist and an avid researcher, looked into the connection between uveitis and psychological distress. While there have been cases linking the two since the 1980s, it isn’t known whether one actually causes the other. Still, Chao finds some solace in thinking there might be an explanation for her uveitis. “It’s always been a big question for me,” she said. That was the case for Chao’s family, which emigrated from China to Claremont, Calif., when she was in elementary school. Although Chao experienced depression from a young age, she waited years to tell her parents. Her father had been a traditional healer in China, where the mind and body are often seen as one. Chao explained that in her culture, when you say mental illness, “people think there’s something wrong with your body.” And they treat it by addressing the physical ailment. Therapy or psychological medication is reserved for people considered “crazy,” she said. “It’s something that comes from a lack of education, not bad intentions,” Chao said. For people in any culture, it can sometimes be difficult to verbalize experiences of trauma. 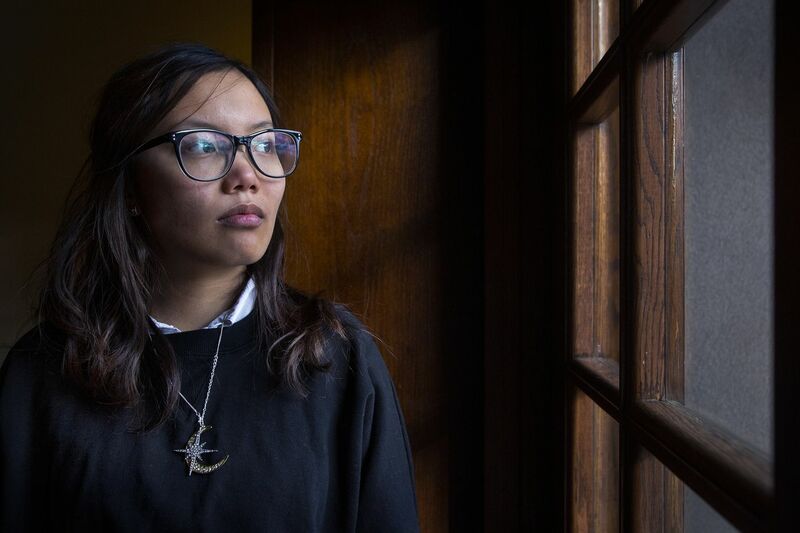 Nary Kith sees this daily in her work with Cambodian refugees in the Logan neighborhood of North Philadelphia. Many come to her with complaints of chest pain, headaches and stomach problems. Yet their doctors haven’t been able to find a physical cause. They’re often suffering long-term, untreated post traumatic stress disorder from the war and genocide in Cambodia during the 1960s and ’70s, said Kith, executive director of the nonprofit Kith’s Integrated and Targeted Human Services. “Having that experience doesn’t go away unless you process it,” she said. Nary Kith (left) and her sister Saroeun Kith work with Cambodian refugees in the Logan neighborhood of North Philadelphia. Kith, who is also Cambodian, was born in a refugee camp in Thailand after her parents fled the war. Her family was forced to move twice more before settling in Philadelphia in 1984. At first they pushed aside the trauma, focusing instead on finding a home, getting jobs and learning the language — just like many refugees Kith works with today. A 2013 study from Massachusetts General Hospital and Harvard Medical School documented neck soreness as a common symptom of PTSD among Cambodians in America. Researchers suggest that it relates to mental trauma of people during the genocide being forced to carry heavy loads of dirt on a pole balanced on their necks. For years, Chao kept quiet about her mental-health struggles. Even when she had thoughts of suicide, she rarely mentioned them at home. Instead, she wrote letters to an imaginary stranger who she thought would understand her pain. That practice eventually led Chao to found a nonprofit called Letters to Strangers, which works to destigmatize mental illness and expand access to treatment. Today, she is open about her mental illness, speaking at mental-health conferences and TEDxTeen. Diana Chao (right) started a mental-health nonprofit called Letters to Strangers with chapters around the world. Among what she considers her most important work is speaking in Chinese cultural centers about recognizing signs of mental illness and seeking care. “Them seeing a Chinese person talking to them about it in Chinese helps the information get across a lot easier,” Chao said. But the responsibility to address this issue shouldn’t lie solely with patients, experts say. Primary-care doctors, often the first point of contact for patients, need to consider psychological causes for symptoms, wrote two Boston-area psychiatrists in Psychiatric Times. But it’s a delicate balance. Doctors shouldn’t assume that every Asian American’s physical ailment has a mental cause, said Jesse Suh, a Korean American psychologist based in Philadelphia. Mental-health clinicians also need to ask about physical symptoms and cultural factors while making a diagnosis, he said. Lovella Calica has suffered gastrointestinal issues since she was a teenager. In her 20s, she experienced daily stomach pain, nausea, indigestion, and heartburn. Now 37, the Filipino American has traced it back to being sexually abused as a child. “I was in therapy during all that time, but I didn’t talk about stomach issues with my therapist,” Calica said. Nor did the therapist ask. Instead, Calica saw countless doctors in Philadelphia, where she lived for 14 years before moving to Michigan last year. In that time, she was diagnosed with acid reflux. But some symptoms persisted. She addresses them through therapy and medication. Lovella Calica has suffered gastrointestinal issues since she was a teenager. Now 37, the Filipino American has traced it back to being sexually abused as a child.